FFT, the market leader in leader fibre optic intrusion detection and location products, is proud to announce the successful supply of its 100th premium high sensitivity intrusion detection controller by its Indian-based subsidiary, FFT India Pvt. Ltd. In marking the occasion, the company has also taken the opportunity to offer its considerable gratitude to Austrade (The Australian Trade and Investment Commission) for its diplomatic and introductory assistance across a number of vital project tenders. 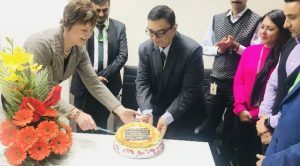 The occasion has been marked by a cake-cutting ceremony held on 17th December in the presence of the FFT team and Leonie Muldoon, Senior Trade and Investment Commissioner-South Asia at Austrade. The ceremony also recognised the continued assistance of Austrade – including direct support from the Senior Trade Commissioner herself, who recently took part in face-to-face meetings and championed FFT’s solutions as part of a successful tender. FFT India Pvt. Ltd. has traded in India for the last six years, having been registered with the Indian Registrar of Companies on 26th September 2012. It has a locally-based expert team of trained and certified engineers in the country which provide solution design, installation guidance, commissioning, training and on-site technical support (both under warranty and post warranty). The company has so far won over 50,000 kms of intrusion detection for perimeter, NLD backbone and pipeline intrusion detection. Projects that FFT India Pvt. Ltd. has completed in India include: pipelines, military facilities, refineries, power sub-stations, multinational HQ perimeters and even international country borders. Key sectors in the region also include: air bases (including Indian Air Force, Navy and Army), commercial airports, DRDO laboratories, defense establishments, oil and gas pipelines/assets, the Dedicated Freight Corridor Corporation of India, thermal power generating plants and sub stations. FFT India Pvt. Ltd. is a wholly owned subsidiary and part of its Australian parent Ava Risk Group Ltd (ASX: AVA), since FFT became part of the new group earlier this year. Being part of Ava Risk Group Ltd has enabled the company to leverage a wider network and more breadth of knowledge and expertise, to fully capitalise on market opportunities and grow its market share in India and other territories around the world. The Group features a range of complementary solutions including intrusion detection for perimeters, pipelines and data networks, biometric and card access control as well as the secure international logistics, storage of high value assets and risk consulting services. Through decades of innovation, the Ava Group continues to build upon a comprehensive portfolio of premium services and technologies for the most complex and demanding markets.